Absolut Vodka and The Windmill Factory commissioned Future Wife to create experiential elements for a house-party-of-the-future. 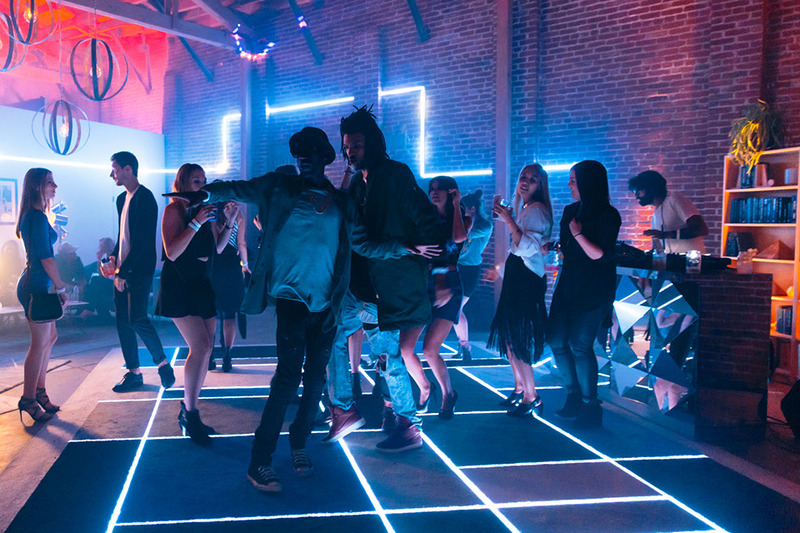 The centerpiece was a carpeted Piet Mondrian influenced dance floor that illuminated guests from below with lines of addressable LEDs which were animated to pulse with the DJ's music. Certain illuminated lines traveled across the floor, along walls, and ended at a large mounted white moose head on an opposite wall that shot high-wattage lasers out of its eyes. All of these elements were slowly revealed as a series of "surprises" triggered by guests' energy levels via skin-resistance sensors worn on their wrists. Unique design constraints (such as a maximum allowed dance floor thickness of 1.5" and a very accelerated production schedule) required the sub structure to be cut similarly to a PCB, complete with through-hole vias and multi-layer electrical pathways, all hidden under the Mondrian carpet panels and acrylic diffusion. This kept thickness to a minimum and allowed for expedited assembly.